* ❤ Khaori Sato オフィシャルブログ ❤ *: My BB Cream Collection & Review. My BB Cream Collection & Review. Okay, as we all know BB cream stands for Blemish Balm cream. It has become popular recently particularly in Asia. Nowadays, there's a lot of brands producing BB creams. Well, who among us doesn't want to try this thing out!! They said this can be a skin care & a base in one. This also contains beneficial properties like SPF, Skin whitening, anti wrinkle & etc. Pretty cool right?!! I almost use this product everyday. Usually, I put this after I applied all my skin care product like moisturizer & etc. Yes. I use this as a base in fact. I put this thing first before applying foundation & concealer. Well, if you don't have that much imperfections on your face that you need to cover, you can skip the foundation and just apply this BB cream as your foundation as well. 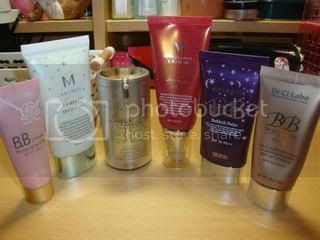 Okay, here's my BB cream collection..
L-R: Beauty Magic BB Cream, Missha M Watery BB cream, Skin79 BB Gold label, Missha Perfect Cover BB cream & Dr.Ci:Labo BB Perfect Cream. 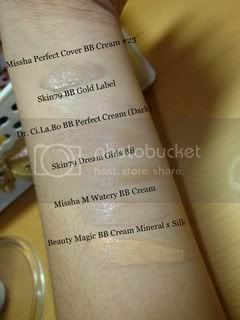 Here's the swatch of each BB cream.. I personally love this BB cream. It has a SPF42 & PA+++. I got the shade in #23. When you first apply, it has a greyish cast, but after oxidizing it matches my skintone! This BB cream evens out my skintone and gives pretty good coverage, medium I'd say. Completely gets rid of any redness I have and gives some coverage to small blemishes. Though I was not a big fan of the texture, as my skin is on the dry side and it was not moisturizing enough for the very dry areas. So if you have super dry skin like me, be sure to apply moisturizer first. And also I love the smell of this BB cream, it smells quite like baby powder or lotion. I love this BB cream! It has a SPF25 & PA++. This BB cream appears to have a light grey cast, but it blends into my skin perfectly after oxidizing. It's very moisturizing and it has medium coverage.It keeps my skin moisturized all day long, and acts as a good makeup base and I don't need as much foundation afterwards. It does have a bit of a white cast, but this melts into your skin after application. It also has a smell quite like a floral scent I think. The packaging is just lovely and very pretty although I'd like to be able to see how much I have left so I can reorder before I run out. This is my first BB cream that I used. It has a SPF30 & PA++. I use in shade dark. It also has a grayish cast but after you applied, it matches your skin tone. This BB cream is not that popular like Missha & Skin79 product. Its one of the rare BB cream I'd say. Its quite pricey like twice as the price of other BB cream brands. There's no fragrance, artificial colouring, no paraben, no mineral oil and Free from UV absorber. So it is as natural as you can get and should be free from any allergic reactions. If you have really sensitive skin, you can try Dr Ci:Labo with ease. It has a pretty good coverage, medium I'd say. It has a SPF30 & PA++. This BB cream designed for trouble skin and has great oil control. It doesn't offer that good coverage but it really has the super dewy finish after you apply this. So it works more for primer/base which is what I exactly use for. It has a SPF27 & PA++. The Watery is very sheer and easy to blend, and it sinks nicely into the skin. I still need to use some concealer on some of my discolorations. It doesn't control oil very well, so you'll still need to use a primer or a powder for that. What I do like about it is that you feel like you aren't wearing anything on your face, yet you still have a very natural, yet improved, look. Its quite liquidy so easy to apply as the name suggests. This cream also has a floral fragrance. It has a SPF30 & PA++. This BB cream is super pale, almost white, with a very light glowy sheen without shimmer. Furthermore it has an unpleasant smell... it is unscented but somehow smells gross which I don't like. This BB cream is also one of the rare I'd say. I bought this BB cream as a set that comes with a little pouch, a face powder and a cute puff. So that's my BB cream Collection & Review. I will buy some more BB cream soon to try.. I will post any updates for my BB cream collection.